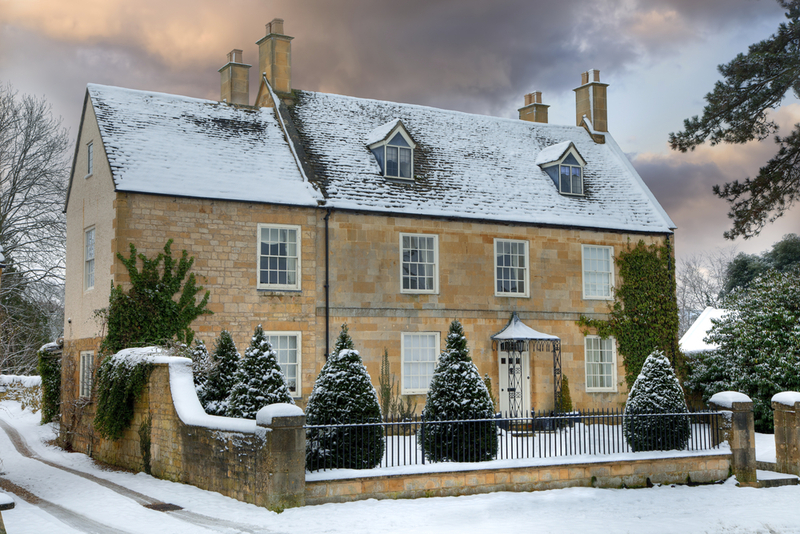 If you’re locking up and leaving your holiday home during the wilds of winter, it’s important to winterise your property by taking precautions to prevent and minimise damages while you’re away. A little time and effort now can save a lot of hassle, and money, further down the line. Here are some top tips to make sure everything will be in order when you open your holiday cottage back up. Drain down the heating system/pipes and shut off the water supply so that there is nothing left in the pipes to freeze. Turning off the water is not enough, you need to drain down to remove the threat of water damage entirely. Drain the toilet cisterns by flushing, then pour a cup of salt down the toilets and plug holes to prevent residual water freezing. Putting neat bleach in the toilet or covering the bowl with cling film also slows down evaporation and keeps it clean. If you need to leave the power on, then unplug all unused electronic equipment to avoid the risk of fire and power surges. Empty and clean the fridge/freezer, turn off and leave the doors open. Also, remember to turn the gas off during long absences. If your property is heated by oil, your supplier should also be able to tell you what additional precautions you should take during very cold weather to prevent oil gelling/freezing and blockages. Electric dehumidifiers are ideal. Use one that automatically switches off when it needs emptying, or one that allows the water to flow into a shower tray, sink etc. Alternatively, leave portable dehumidifier boxes around the house, or as a cheaper alternative put bowls of salt around or even cat litter in a tray. They soak up excess moisture in the air to reduce damp. Ventilation is one of the best ways to avoid damp. Leave doors open in order to allow air circulate between rooms. Ideally, on a monthly basis open the doors and windows for an hour or so, to let some fresh air in on a dry day. Buy some cheap bed sheets and lay them over furniture and furnishings to prevent mould. Pull your furniture away from walls and damp windows, to let air circulate. Use vacuum bags to store bedding, cushions etc. Store outdoor furniture and loose items in the garden in a garage or shed. Leave nothing outdoors that can be blown about by strong winds or be stolen and keep gates fastened securely. Check that all your windows and doors are locked when you leave to prevent unauthorised access. Ensure that garages and sheds are secured to reduce break-ins and squatters. Install smart devices such as security cameras, motion sensors, heat/flood detectors and lighting that can be managed remotely to monitor risks. Have interior lights on a timer to make it look like someone is home. Also, install motion censored lights for the exterior of the house as a deterrent. Installing a burglar alarm deters most ‘opportunist thieves’. Food attracts vermin. Any food that is left in the property should be locked in metal containers with tight lids. Inspect the loft and look out for droppings, smells, evidence of gnawing or chewing. Ask a neighbour or a property manager to inspect your empty holiday home for damage regularly. Make a checklist of all the things you’ve done so when you return you’ll remember all the things that have to be “un-done”. Even if you are only leaving your holiday home unoccupied for a short period during winter, you should read our advice on how to prevent frozen pipes and bursts. Here is a checklist of essential winter maintenance tasks holiday homeowners should do. More than half of Britons fail to read the terms and conditions of their insurance policy. Your holiday home is at the most risk when it’s left empty – that’s a fact. If you are leaving your holiday home unattended for a long time over winter you should check you are covered by your holiday home insurance. Do you have to drain down? Maintain a minimum temperature? Increase security? Or check your home regularly? These clauses could void your insurance coverage if you don’t fulfil your obligations. You should also be aware that Insurers are unlikely to pay for claims that are as a result of poor maintenance. By keeping your holiday home well maintained when you lock it up for winter, you are reducing the risk of damage. After all, “Prevention is the best cure”! Its worth considering the security of your property if you are leaving it empty. We recently installed 3 light switch timers on our holiday property which work very well as they simply fit over the light switch on the wall in seconds. Make the place look occupied. Not common salt but calcium chloride. In fact I did a comparison test using the Aero 360’s and buckets containing the salt…same results! A rain gutter maintenance is required at least twice a year(before the cold season and after) for a healthy gutter system. I’m saying this as a professional that has witnessed way too many unnecessarily neglected gutters, and people wondering why are their roofs leaking or rotten. it’s not something difficult, it’s a bit time-consuming, you can do it yourself if you are comfortable on a ladder, just please, for the love of God, take some of your precious time just two times a year and prevent damage to your property! Thank you. Great home maintenance tips – you have covered pretty much everything there is to it. Well done. Regards, Chambers, a professional in the field. Thanks Robert. Great advice that can prevent unwanted problems from water ingress and damp.